Edgewood Avenue is a city street that connects Upper Westville with Downtown New Haven – traversing the Lower Westville, Edgewood, and Dwight neighborhoods. In the 1830s, the first segment of Edgewood Avenue, then known as Martin Street, was laid out from Park Street to just beyond Dwight Street in order to facilitate growth of a satellite village west of the Nine Squares. By the 1850s, the street had been extended to reach the city’s Almshouse located near the present day intersection of Edgewood Avenue and Brownell Street. At this time, the fabric of the West Village reached Day Street, but was poised to expand rapidly with industry, shops, churches, and housing for laborers, shopkeepers, and factory managers in the next two decades. By the time the bridge was built across the West River in 1873, the satellite village – today referred to as the Dwight neighborhood – populated a tight network of streets extending to Sherman Avenue. In 1883 when the Edgewood neighborhood was being subdivided and developed as a streetcar suburb, Martin Street officially become Edgewood Avenue. The Mall between Winthrop and Pendleton Streets was completed by the early 1890s and became a desirable locatation for large, ornate houses with side streets welcoming two-family homes for the middle class. 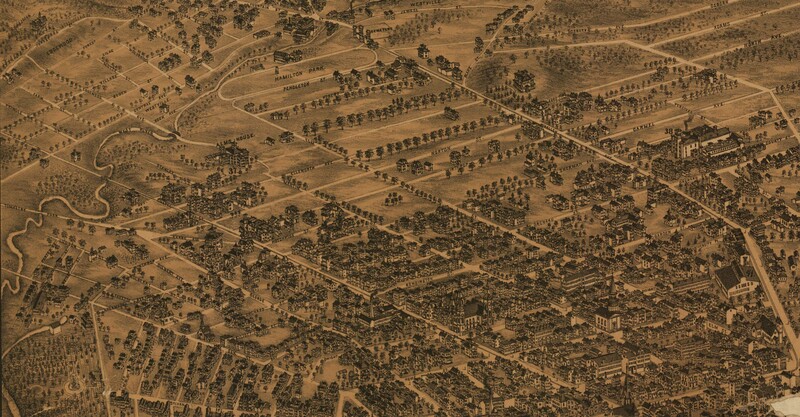 In the 1890s, many of New Haven’s horse-drawn streetcar lines were replaced with electric trolleys and new lines were added, including one along Edgewood and Alden Avenues, which precipitated the subdivision of Lower Westville as a residential suburb. Though some construction on the flats of Westville pre-dates the automobile, most housing construction in the neighborhood occurred after the 1920s and was instead oriented around cars. Two-family houses lined the trolley route along Edgewood and Alden, while more substantial homes faced side streets – an inverse of the earlier pattern present along the Mall, indicative of the noise and traffic associated with the automotive age. In the post-War years, development reached Donald Grant Mitchell’s former Edgewood estate. Upper Westville was subdivided and developed as a mid-century automobile suburb characterized by modest homes on elongated streets winding through a rolling landscape. Meanwhile in Dwight, Urban Redevelopment projects were separating the neighborhood from Legion Avenue and the Hill. In the wake of the construction of the Oak Street Connector, having never been fully realized, the Dwight and Edgewood neighborhoods declined significantly. Having lost much of their middle class home-ownership, industry, and commerce, the neighborhoods suffered from high crime rates, deterioration, and abandonment in the last two decades of the 20th century. To combat this, groups like the non-profit affordable housing developer Neighborhood Housing Services rehabilitated homes throughout both neighborhoods and the Greater Dwight Development Corporation attracted major supermarkets to underused parcels. Today, the housing market in Dwight and Edgewood has begun to rebound as students and families increasingly are able to find desirable and affordable housing in the neighborhoods. Most recently, a luxury apartment building, the Novella, was constructed on a former parking lot at the corner of Howe and Chapel. This section of Edgewood Avenue, the oldest and narrowest, terminates at Yale University’s Pierson College, but not before passing the former Dwight School, an urban renewal-era project that was recently renovated for Amistad Academy. In this portion of the Avenue, there is one on-street parking lane on the south side of the street and two lanes both traveling westbound towards Downtown. The land-use along this section tends to be older construction, higher density residential, and some commercial presence. In the 1950s, many of New Haven’s streets in the Downtown and surrounding neighborhoods were converted from two-way to one-way in order to better facilitate car travel into and out of the city; Edgewood Avenue west of Winthrop likely became one-way during that time. Passing the Troup School, constructed in 1924 and renovated in 2008, Edgewood widens slightly between Orchard and Winthrop to accommodate an additional parking lane on the north side of the street. A child of the American Park Movement, the Edgewood Avenue Mall was designed as a broad promenade with opposing traffic separated by an 85-foot wide planted median. Each street on either side of the median has two lanes running eastbound and westbound, respectively, with a parking lane adjacent. This section of of Edgewood Avenue transitions to a two-lane, two-way street with parking on either side as the street. Crossing the West River on an elegantly designed bridge, eastbound travelers are greeted first by Edgewood School, then multi-family residences, small offices, and cafes, followed by the side yards of large houses, and finally met with a steep elevation change leading towards the Hopkins School and Upper Westville. The following outlines how a protected cycle track and separated bike lanes could be implemented onto the existing Edgewood Avenue right-of-way with minimal impact on the carrying capacity of the street. While inspired by outgoing work by the City of New Haven (see here, here, and here for details), these images do not necessarily reflect those plans. Along the first segment of Edgewood Avenue, the parking lane and adjacent travel lane would be narrowed slightly with the northern travel lane being converted to a two-way cycle track protected from car and bus traffic by delineator tubes. With two eastbound travel lanes and a single on-street parking lane, this section of Edgewood Avenue is designed to handle 18,000 vehicles per day, yet only an average of 4,200 vehicles actually use this portion of the street on any given day. Therefore, there is ample room to accommodate cyclists without impacting motorists because the proposed configuration can still handle 5,000 vehicles. On the second segment of Edgewood Avenue, one car travel lane would be replaced with a parking lane so that the protected cycle track can be continued on the north side of the street. Similar to the lower portion of Edgewood Avenue, only around 4,200 vehicles use this street per day. However, with two eastbound travel lanes and two parking lanes, the street is designed to accommodate around 20,000 vehicles per day. This excess road space could be used more efficiently were it partially dedicated to protected cycling infrastructure. Doing so would narrow the roadway, giving it the character of other nearby streets like Winthrop Avenue though without cycle track, which are designed to handle around 8,000 vehicles per day. Along the Edgewood Mall section of the street, the protected cycle track would split into separated bike lanes. Again, one travel lane would be removed in each direction, a parking lane would remain, and the cycling infrastructure would be separated by a buffer zone. While this section of Edgewood Avenue is traveled by slightly more vehicles than the one-way portion, at 4,800 vehicles per day, the street is still overly designed to accommodate 18,000 vehicles in each direction. By replacing a travel lane in each direction with a separated bike lane, Edgewood Avenue can still handle 5,000 vehicles per day along with cyclists. West of Edgewood Park where the roadway is about 41 feet wide, several issues arise when trying to incorporate a two-way protected cycle track along the Westville portion of Edgewood Avenue. Between Yale Avenue and Central Avenue is the K-8 Edgewood School, a corner cafe, and several blocks of multi-family housing. While predominantly useed by residents, overnight on-street parking is is also used by the teachers, parents, and commuters stopping for a cup of coffee in the morning. Fortunately, Edgewood Avenue is wide enough between Yale and Central to accommodate a narrow two-way cycle track built on top of a reconstructed curb and separated from the roadway. This configuration requires each cycling lane to be only 4-feet and removes the buffer between parked cars and bike riders. However, by rebuilding the Edgewood Avenue curbs on one side of the street between Yale and Central, the cycle track would be raised above the roadway by about 6 inches – providing some separation, though not as much as in other sections of the street. While current on-street parkers would likely be able to use driveways, side streets, and the north side of Edgewood Avenue to park, this design accommodates the local businesses, residents, and visitors, while only slightly compromising the protection and effectiveness of the cycle track between Yale and Central. Beyond Central Avenue, the two-way buffered cycle track would return to the roadway, but a parking lane (preferably on the south side of the street) would be lost. In this section of Edgewood Avenue where sideyards mostly abut the roadway, on-street parking is abundant and any loss in spaces would be absorbed on the opposite side of the street, or on side streets. The Westville section of Edgewood Avenue is designed to accommodate 15,000 vehicles per day, yet is only used by 4,400 vehicles on an average day. And actually with the removal of a parking lane, the street would be able to handle 16,000 vehicles. Edgewood Avenue in Westville would take on the character of Elm Street with the addition of a two-way protected cycle track. During the 1950s, many of New Haven’s streets were redesigned to accommodate commuting into and out of the city for suburban workers and shoppers. As a result, many of the city’s street have become inundated with car traffic and are unsafe for other road users. 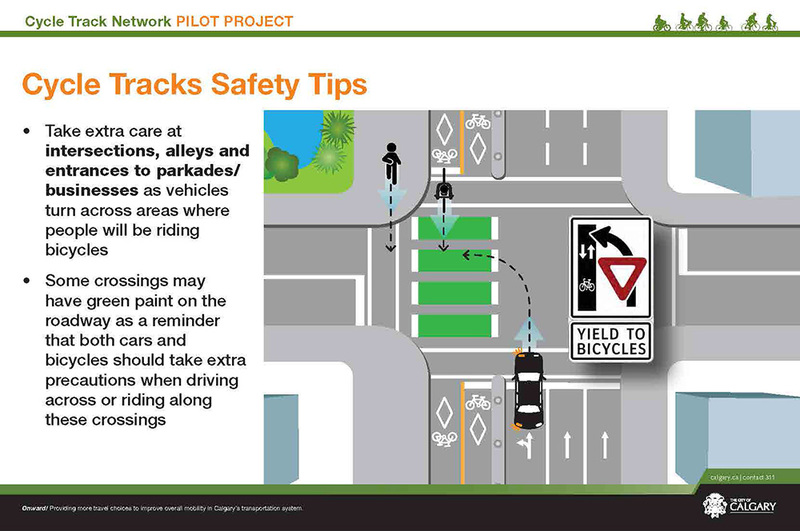 Edgewood Avenue represents an opportunity to connect five city neighborhoods, five schools, and encourage cyclists of all ages and abilities to take to the streets – all with minimal impacts on drivers. Edgewood Avenue’s existing roadway carrying capacity far exceeds its use, which allows a single car travel lane to be removed with ease. In Westville, a parking lane would be lost, but on a section of the street where an enormous surplus currently exists. In the remainder of the corridor, no parking spaces would be lost. For me, the benefits of massively increasing cycling, expanding transportation opportunities for those without a car, and calming traffic on the west side of the city greatly outweigh the potential loss of a few parking spaces.